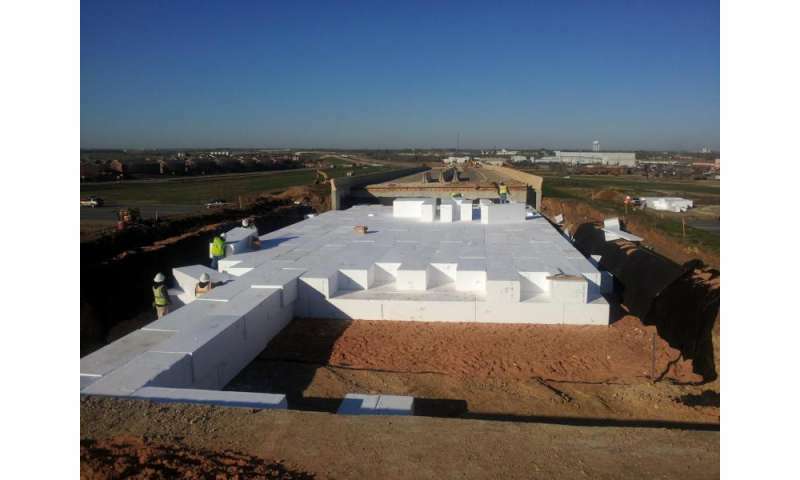 A research team at The University of Texas at Arlington is using giant lightweight geofoam blocks to bolster the earth beneath roads and bridges and slow down the settling of roadways and bridges. Anand Puppala, UT Arlington associate dean for research in the College of Engineering and distinguished scholar professor in the Civil Engineering Department, said that the majority of the world's largest cities, often built in areas near water bodies, have soft and compressible soils. He said a good number of the 52,000 bridges in Texas have bump problems on entry due to settling of the soil under the pavement slabs. A new $336,000 implementation grant from the Texas Department of Transportation received by UTA's Sustainable and Resilient Civil Infrastructure Center will allow Puppala and his co-researcher, assistant professor Xinbao Yu, to test the use of the geofoam blocks to ease the problem. The blocks measure about 6.5 feet by 2.5 feet by 2.5 feet. Puppala, Yu and their team have installed the blocks near a bridge at U.S. Highway 67 and State Highway 174 in Johnson County to attempt to slow serious settling at the bridge entrance. This area has settled 17 inches since 1995 due to heavy truck traffic loads, which was close to one inch per year. The UTA team replaced an embankment near the bridge with geofoam blocks in 2012. In the three years since the installation, the team has measured a total of less than one inch of settlement. The new implementation grant will allow more monitoring to make sure the blocks continue to work. To install the blocks, crews dig out the area where they are going to be used, stack the blocks on top of each other to achieve the necessary grade and road width, then cover them with soil, which is then packed down before pavement is laid on top of the stack. IIRC, this technique has long been used under Scandinavian coast roads.. The article makes it sound like this is new tech. Foam blocks for this kind of construction have been in use since 1972 with a large project in Utah in 1997. Was this research done on prior use in other states/countries? this article is slightly better than a fluff sketch for UT. mjamgb already beat me to the punch, but I'm really surprised that the TxDOT views this as something new and worthy of study when it's already been in use elsewhere for many years. I find it ironic that the university doing the study goes by the initials UT or UTA, when UT (Utah - as in UDOT) and UTA (Utah Transit Authority) have done numerous major projects using foam blocks for the very purposes stated in this article.